07 May Top 5 Reasons to Visit Downtown Las Vegas Today! We all have our own reasons to let loose every now and then. And, to be honest, any reason is good enough for us. We assume that while you’re making your decision to go hit the town, you’ll be thinking of reasons to visit downtown Las Vegas. If you haven’t been to DTLV before, you’re in for a treat! Not only is everything within walking distance, but you’ll likely end up walking beneath an LED light show. Above Fremont street is a huge screen that, during the day, shows a clear blue sky and, during nighttime, shows a visual show of music and flashy lights. In that same area, you’ll find all sorts of entertainment ranging from live shows to street performers. You’ll also get to zipline down the Fremont Street Experience on a zipline called “Slotzilla.” It’s always a unique sort of blast! There aren’t many better reasons to visit downtown Las Vegas (or anywhere for that matter) than the food. If the food is good, it’s worth checking out. DTLV is definitely no exception. With options like Pizza Rock, Andiamo’s, and Carson Kitchen, it’s no wonder people make this their dine-in destination. As much as we love the Strip, it certainly lacks in a huge way: atmosphere. If you feel anxious or uncomfortable on the Strip, you’re not alone. One of the best things about DTLV is how you can hang out and vibe. It’s also a much more relaxed environment, intentionally. A lot of it has to do with the awesome people you run into. Everybody there is having a good time and are pretty much on the same page in terms of vibes. The biggest difference between the Strip and DTLV just might be the drink selection. When you’re downtown, you’ll get a comparable list of drinks, with some quirky options thrown in there—but, best of all, they’re really not at that great of cost. We saved the best for last. The best reason to visit downtown Las Vegas is for the Vegas Pub Crawler. 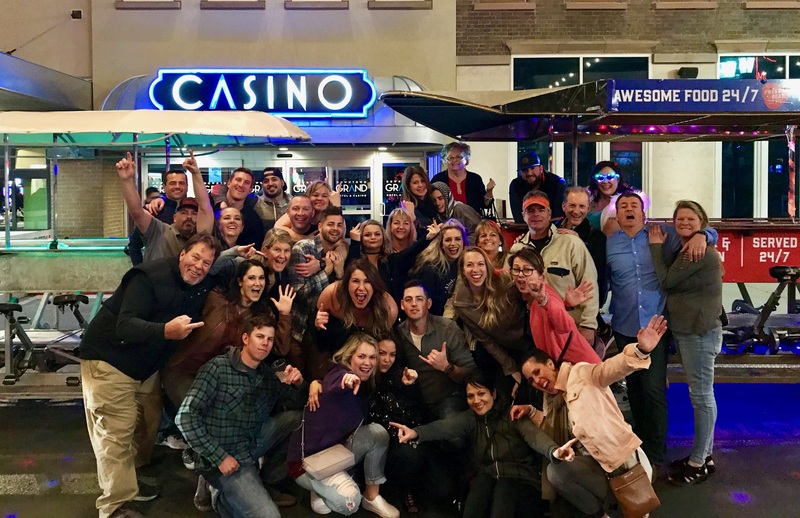 When you book a tour with the Vegas Pub Crawler, you’ll be seeing what DTLV has to offer while spending time with a bunch of strangers or some friends, but you’ll be enjoying some cheap stiff drinks. And where will you find these stiff drinks…? There are plenty of reasons to visit downtown Las Vegas bars and what better way than to hang out with the Vegas Pub Crawler? Book your pub crawl with us today!